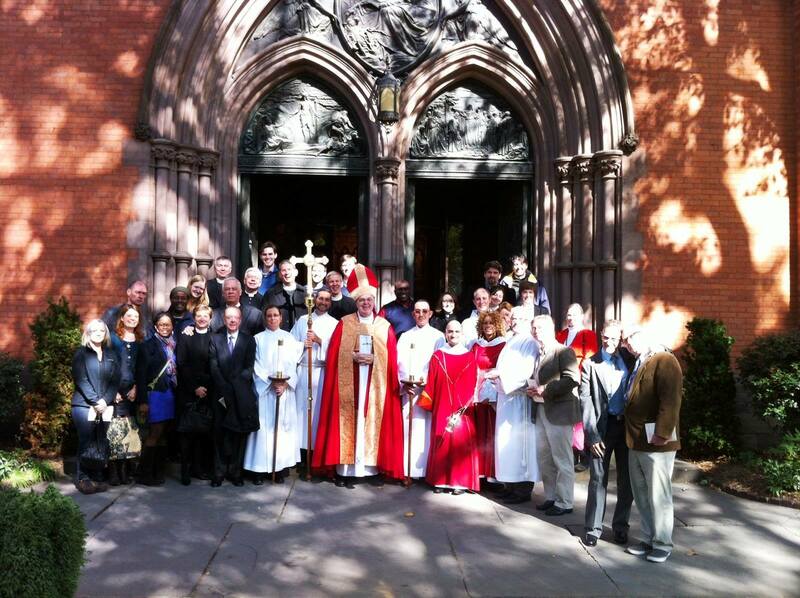 It happened – the Lutherans took over General’s Chapel. Yesterday, at our Thursday Eucharist, the Lutherans of the Metropolitan New York Synod stormed into the Chapel of the Good Shepherd, and spread law and gospel all over the place. Our six foot tall bishop with his 20 foot tall hat, with a mighty whack of his boot, battered those doors down and we, like our barbarian and viking ancestors of old, poured into that place and, let me tell you, we processed the hell out of that place! Luther himself would have been proud – some of us even sung “A Mighty Fortress” in GERMAN. We Lutheranized the place, taking over the liturgy, the space, and even using the words law and gospel from the pulpit. I am not the biggest fan of high mass worship services (or even calling Lutheran worship services mass) but we tore that place up. The pastors of St. Peter’s organized everything, bringing their own vestments, choir, organist, and deacons to the service. The service was intentionally designed to be welcoming to our episcopalian friends by including a thurifer, incense, smells (but no bells) and even praying for the Archbishop in the prayers of the people (along with all our other ecumenical partners). The service even had me as a sub-deacon. Sub-deacon! I still don’t even know what that was (but my episcopalian friends were really confused and thought I was ordained already). But I did get to serve alongside the bishop. That was fun. We had around 65 students, professors, alumni, and guests present. Bishop Rimbo preached a fine service and the gluten free bread provided by St. Peter’s was actually delicious. We filled the chapel with sound and singing, outdoing any Episcopalian service that I’ve been to yet. And we made sure that the entire service was in the bulletin. Not having to use three different books during the service blew everyone’s minds. The comments from the student body to me have been nothing but positive. They loved it. They want to see more of it. And, I’m with them on this because I found this whole thing awesome. But (and there’s always a but) I’m still struggling with the very idea of this kind of worship service itself. There are, at most, three Lutherans on campus. We’re minority and we get that. We also understand the Chapel of the Good Shepherd to be this community’s sacred space. But the very source of how this happened – where the Lutheran liturgy was transplanted into the community from outside of it, that bothers me. The service only worked because we brought in our own choir, organist, and vestments. I felt like being a member of a band on tour. We came in, setup our stuff, had an amazing show, and then packed up and left. Even though law and gospel was preached, the sacraments celebrated, and worship was done beautifully and well, we were still a show. This wasn’t a service rooted from within the community, it was a showcase. And that gets me because the Lutheran liturgy isn’t a showcase. It’s worship but worship for a gathered community. It comes out of the community that the Holy Spirit has called to be at this specific place and at this specific time. The community carries with it tradition, history, understanding, hopes, loss, fears, doubts, joy, anger, and everything else. All of that feeds into the liturgy that speaks to the community. The Lutheran liturgy, when done well, is fed by the gathered community and by God. It isn’t a show – it is the place where God promises to be and where we can, as the gathered community, reliably meet God in a very earthly way. The community at General isn’t Lutheran and that’s okay. And it’s fine to do a worship service, every once in awhile, that showcases the vastness of Christian history and experience. But it can never be just for show. If it is, then it really can’t be called worship, can it? But, well, it was a lot of fun filling that Chapel with Lutheran sounds, words, images, and noise. And I did look good standing up there, yessir. And it felt downright subversive to say ” “the blood of Christ for you” during communion in that space. So maybe I was the barbarian in that space. I’m okay with that.